This week the remaining three ducklings were busy getting on with life, whizzing round the pond and even on occasion diving as well as enjoying a regular afternoon nap on the duck island. The parent adult ducks seemed to have settled into a routine with them as well and the other female was conscientiously sitting on her eggs. Then in the early hours of Friday morning disaster struck. The duck pond and house are right by our bedroom window and we were woken up by loud quacking about 1am. We couldn’t see anything outside but two of the adult ducks were on the pond and refused to come back to shore. The next morning we discovered one of the adult females, all the eggs she was sitting on and all of the ducklings were missing. The remaining drake and duck seemed fine, if a little wary and they were still keen to stay on the pond. I did try and persuade myself that Auntie duck had taken the ducklings away for a wander but there’s been no sign of them. I think it’s much more likely that Mr Fox has paid a visit. There was no sign of any blood or feathers but I can’t think what else could have happened to them. Since that night the remaining ducks have stuck to sleeping on the pond and they’re still with us so hopefully Mr Fox won’t be taking anymore of our ducks. This is the first time we’ve lost birds to a fox despite having free ranging ducks and geese for the past year so I think we’ve been quite lucky. The chickens are surrounded by electrified poultry netting but don’t seem to have been paid a visit by Mr Fox. We could try and rig up some electric wire or netting around the area where the ducks are but I’d rather try and encourage them to keep sleeping on duck island which seems to be out of the reach of the fox. So for now we just have the two ducks but they bred successfully this year so hopefully they will do the same next year and learn to outfox the fox. There is a lot of advice and information online about tactics to get rid of foxes. However, having done a fair amount of research I think it comes down to three approaches. Firstly you can just accept that with free ranging birds you will lose a certain number to predators. Secondly the use of physical barriers; either very high fences that are also sunk into the ground or electric fencing and thirdly shooting the fox. Some advocate such measures as urinating around the perimeter of your land or getting a dog and whilst this might work for a short while foxes are wily and persistent and if they have cubs to feed they will take risks. 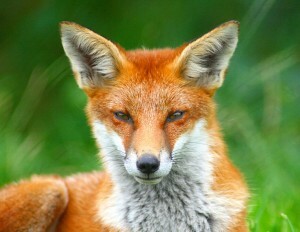 Annoyed as I am about the loss of our duck and ducklings the fox is just doing what foxes do. The ducklings have been with us just over a week now and it has been quite a perilous week for them, with the majority not making it. Out of 12 fertile eggs 10 hatched successfully. The other 2 seemed to have died halfway through hatching. The first night 3 of the ducklings got stuck in the reeds on the pond and so were unable to get back to the nest. I’m guessing it was too cold at night for them on their own and we found them the next morning in the reeds. That left 7 ducklings which was quickly whittled down to 5 because the mummy duck accidentally stood on two of them. She is a first time mum and did seem to be struggling a bit keeping track of her brood. We then lost another 2 ducklings in mysterious circumstances on consecutive days. One minute they were there then they were gone. There was no body or remains, no signs of a struggle. We think perhaps an aerial predator took them, a bird of prey or perhaps a magpie or some other feathered fiend. Being down to 3 ducklings I did worry that we would soon have none left and we discussed whether to take them away from the adult ducks to raise inside. We decided not to. Mainly because we had always planned on the ducks being totally free ranging and pretty much self sufficient, just getting on with it as nature intended. Having made that choice it seemed a bit of a cop out to then change our approach simply because we didn’t like the course nature was taking. Happily things seemed to have taken a turn for the better. The adult ducks seem better able to cope with just 3 ducklings. 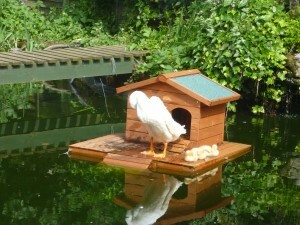 They have started herding the ducklings into the floating duck house when there are any unexpected noises or anything that might indicate an intruder and are a lot more attentive to ducklings. So hopefully we’ll have no more duckling disasters and next time mum and dad will be more experienced and able to cope with a larger brood. Our surviving 3 ducklings might also be joined by some half brothers and sisters in the near future as well. Our other adult female duck has now decided to sit on a nest of eggs and she’s taking it very seriously rarely leaving the nest. Fingers crossed she’ll be successful and the other duck and drake will pass on their new found experience. Here’s a few pictures and video of the little family. 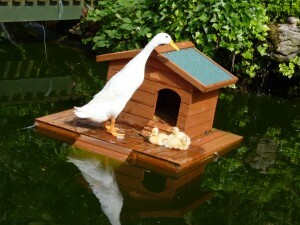 Mummy duck is the one on the floating duck house at the start and Daddy duck is on guard duty at the side of the pond. Only a day old and the ducklings have started exploring Hooters Hall. We’ve managed to count them all now and there are ten in total. Although some of them follow mum around the others just wander and do their own thing. The adult ducks ( Mum, Dad and Aunt) keep a close eye and are quite protective if you get too close. Here are some videos.